BEIJING — Leading economies and advocates of free trade, China and Germany are seeking to forge closer ties in trade and investment to help global economic recovery and encourage globalization. President Xi Jinping arrived in Berlin Tuesday for his second state visit to the country, and is scheduled to meet German leaders and sign a series of cooperation agreements. Bilateral cooperation has delivered real benefits to the two peoples and played a leading and exemplary role in boosting Europe's cooperation with China and Asia, the Chinese leader said in a written speech. In face of rising global uncertainties, China is teaming up with the EU to fend off external risks and weather hardships, with Germany as a major driving force for the collaboration. "Germany has been playing an important and very positive role in promoting economic cooperation between China and the EU, while some countries in the region still hesitate due to concerns about their domestic industries," said Xu Hongcai, an economist with the China Center for International Economic Exchanges. During Xi's first state visit to Germany more than three years ago, the two countries lifted bilateral relations to a comprehensive strategic partnership. "Today and once again, the China-Germany relationship is standing at a new start point, and facing new opportunities for development," Xi said, adding that he would like to join German leaders to fix new targets and set new directions for bilateral cooperation. Chinese Ambassador to Germany Shi Mingde described the economic cooperation as the anchor in bilateral ties. "China became the largest trade partner of Germany last year, and the latter has been the largest investor in and technology exporter to China in Europe." "The two sides are highly complementary to each other. While China can produce a wide range of products and boasts advantages in the light industry, Germany tops the world in high-end equipment manufacturing," said Liu Yingkui from the China Council for the Promotion of International Trade. Germany is one of a handful of countries that have a trade surplus with China, with its transport equipment, chemicals, watches and machinery components popular on the Chinese market. Bilateral trade totaled $151.29 billion last year, according to the the Ministry of Commerce (MOC). Two-way investment was also robust. China pumped over $2.95 billion into Germany in 2016, a 258.6 percent increase from a year ago. In the same year, Germany launched 392 new projects in China with actual investment of $2.71 billion. "The two countries have broad prospects to expand cooperation," said Yao Ling, a research fellow with the research arm of the MOC, citing areas including manufacturing improvements and industrial digitalization. The Chinese president has proposed to enhance the synergy between "Made in China 2025" and Germany's "Industry 4.0" concept. Unveiled in 2015, the "Made in China 2025" plan aims to transform China into an innovative manufacturing country. The German "Industry 4.0" concept, coined in 2011, is designed to facilitate automation and data exchange in manufacturing technologies, including cyber-physical systems, the Internet of Things and cloud computing. German firms have shown great interest in the proposal. More than half of German companies that own factories in China regard the plan as positive for their operations over the next five years, according to a report by the German Chamber of Commerce in China. The report said German firms in China are generally upbeat about the outlook for the Chinese market this year despite downward economic pressure, predicting stronger turnover and profits. There has been successful corporate cooperation. China's Baosteel and Germany's Siemens have jointly participated in Industry 4.0 steel projects, while China's Haier and Germany's Fraunhofer Institute have set up a smart washing machine plant. At the Hanover Fair, one of the world's largest trade fairs for industrial technology, in April, China was the second largest exhibiting nation after the host Germany, with around 1,200 participating businesses, including telecom giant Huawei. "The two countries, although in different stages of development, can create mutual benefits via such innovation cooperation," Yao said. Analysts also pointed out enormous potential for the two countries to cooperate on other areas, such as the Belt and Road Initiative, and expect a closer China-Germany partnership to improve inclusive growth and global economic governance. It is the second stop of President Xi's ongoing European tour which first took him to Russia. During his stay in Germany, he will also travel to Hamburg to attend the G20 summit. 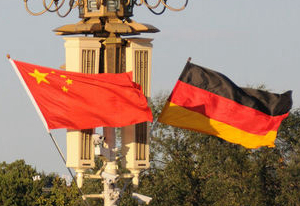 This year marks the 45th anniversary of China-Germany diplomatic relations.